Hector Leonardi has been communicating the joy of painting through his art for over forty years. He received a BFA in Painting from the Rhode Island School of Design in the early fifties and an MFA at Yale University where he studied with and was mentored by Josef Albers. His first job was as an assistant to industrial designer, Russel Wright, and later, he taught basic design, color theory, and drawing at The Parsons School of Design for twenty years. 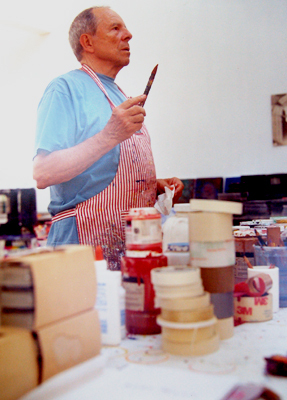 However, Leonardi’s primary focus for the last four and a half decades has been as an artist who merges abstract expressionism and European modernism with his own unique and personal painting style. Throughout his career, Leonardi has had a consistent stream of solo exhibitions in prestigious Manhattan galleries, and his work has also been shown across the country and in Europe. He has received impressive honors and awards as well as glowing reviews in a number of publications, and his paintings are included in many private and public collections.